CD comes in a black DVD slimcase. Ltd. to 500 copies. Info: ontemporary corporative media have a tendency to arrest society’s attention and when it is captured - infect it. This is an ideal environment for cultivating phobias and panic, when the infected individual gets in contact with environment, which doesn’t correspond to the coded standards of security. STROPS is occupied with breaking these codes, using the unused arms of media arsenal for creating new space, where these arms are turned against their creators. 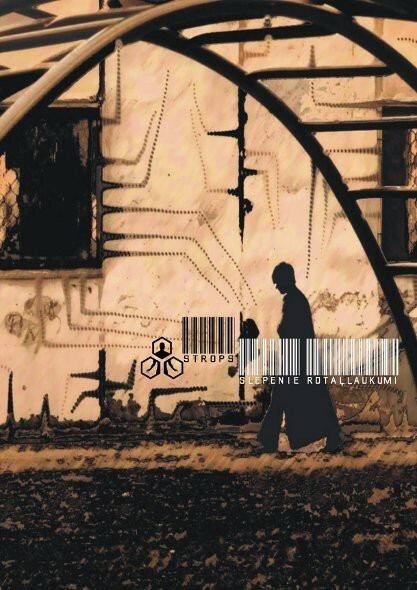 'Slepenie Rota?laukumi' is a 16-episode multiform debut from a famous Latvian industrial recruit. The record embraces both home listening and club-oriented material thus offering a polychrome sound spectre of cryo-ambient vibes with metallic percussion stings, harmonic key sections and rhythmic noise elements, all interlaced by lyrics of dramatic doom. Originally released as a CD-r by Sturm label in 2004, this magnum opus is now available for wider audience via Old Captain CD production. Customer evaluation for "STROPS - Slepenie Rotallaukumi CD (Lim500)"